Yet more recently the group has set its sights on groups like political party UKIP and has pursued campaigns against former leader Nigel Farage and right-wing journalist Katie Hopkins. 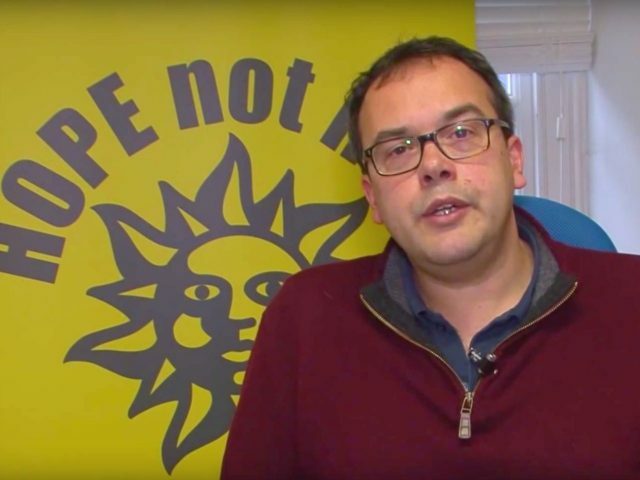 Former UKIP parliamentary candidate Peter Harris claimed that HnH had acted as “attack dogs” for Labour MP Jon Cruddas during this year’s general election. The U.S. Hope not Hate website is sparse, other than asking for donations. The registered address for the group is in the UK, meaning that it is likely not registered in the U.S. as a charity. The site does not go into detail on whether or not its “undercover operatives” will be from the U.S. or flown in from the UK. HnH is also partly funded by the UK government and one of its directors is sitting Labour MP Ruth Smeeth. The announcement of the new operatives may raise questions over the creation of a foreign-funded spy network, operating in the United States. Hope not Hate also has ties to the Southern Poverty Law Center (SPLC), and both groups regularly cite each other’s research and material. The SPLC was slammed by many after claiming that UK Muslim reformer Maajid Nawaz was an “anti-Muslim extremist”. Nawaz said earlier this year that he was going to sue the SPLC for defamation for their characterisation of him, saying that the organisation put him in danger from radical Islamists.